A local beach in Capdepera. All photos by Jeralyn Gerba. Good wine, great food, crystal-blue swimming coves, centuries-old streets for strolling. Mallorca ticks off all the boxes on your summer vacation list. So why aren't you there yet? 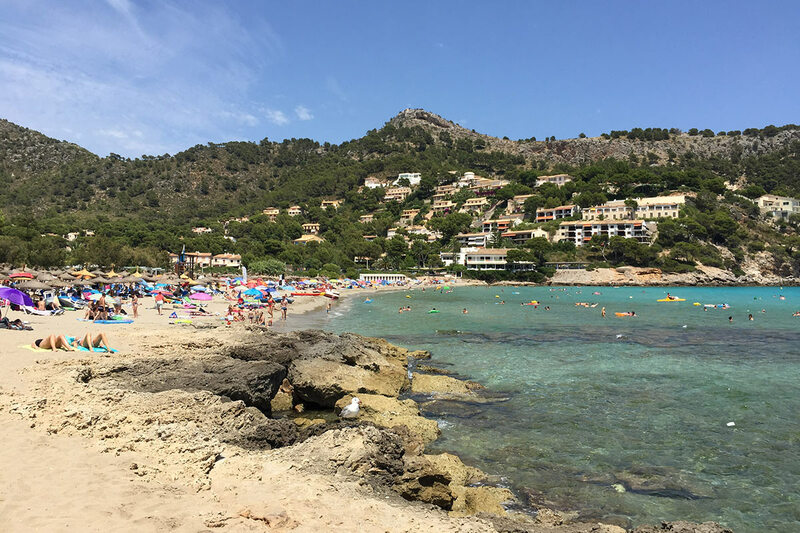 MALLORCA, Spain – The creature comforts of Europe coupled with an island vibe — that's the beauty of Mallorca, the breezy, beachy Balearic island on the Mediterranean Sea. 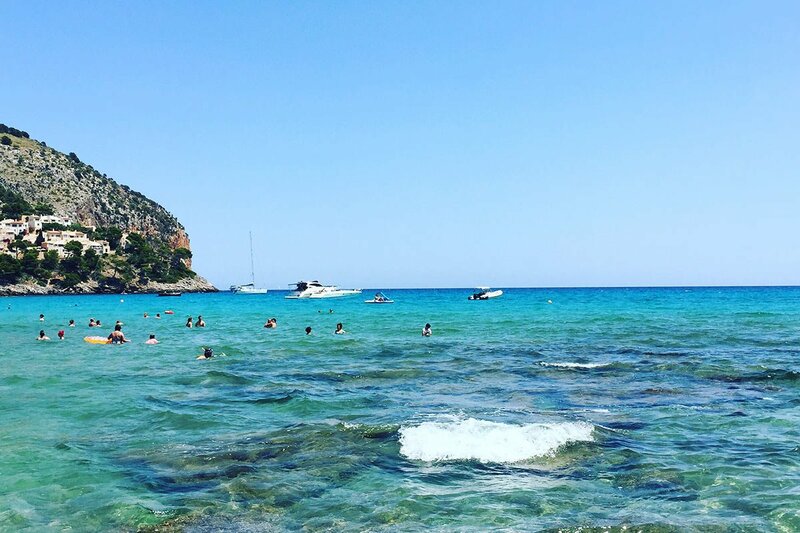 You could easily make up for your lack of summer Instagrams with a three-day holiday to this Spanish gem (the quiet, casual, rustic neighbor of keep-your-shades-on Ibiza). Driving through the countryside, you'll find pockets of the old world. The stunning terraced stone lanes of Valldemossa hug the Tramuntana Mountains and open up to deep valleys. Those iconic rippled roof tiles pop against so much greenery — archways, doors, and street corners are living vignettes of overflowing with vines, flowers, and potted plants. The town's stunning 13th-century monastery, built as a royal palace, hosted Chopin one winter nearly 180 years ago. Festivals happen all summer long, with parades in the streets and performances in the cloisters. , a vintage open-air trolley, has been running daily service between the main city of Palma and the town of Soller (94km away) since 1912. The inland town is nestled in an orange grove, and you can find tall glasses of fruit juice sold at cafes and street stands. A stroll through the botanical gardens gives visitors a glimpse of the local flora and fauna. The relatively new has a nice collection of Spanish artists like Picasso, Miro, and Chilada showcased in a wonderful Modernist building with exposed beams and decorative tile floors. The swankiest port in Mallorca is Port Andratx, a fishing village that regulary welcomes splashy yachts and their perfectly coiffed passengers. Have lunch on the beach of Sant Elm, then take a small boat to nearby Sa Dragonera, a hikeable and bikeable island designated a natural park. It is well worth timing your day trip to Santanyi to fall on a Wednesday or Saturday when the streets fill up with lively market stalls. Navigate away from the imported stuff and look out for carefully crafted Mallorcan goods, like food products, spices, and crockery. Your best bet is to get an early start — once the market starts to fill up with patrons, you can take in the bustling vibe from a seat at a local taverna. This is what the day looks like. There's nearly 140 miles of coastline and dozens of gorgeous swimming coves, expansive beaches, and protected sandy areas. On the island's west side, Cala Falco is great for kids. A shallow entrance into the narrow cove, means the water is generally calm and clear. Refreshments are served at a little beach bar. The popular Camp de Mar sees more traffic (a resort looms in the not-too-distant background), but there are more amenities too: pedal boats for rent, and a popular, casual restaurant that juts out into the water. On the more isolated east side, Cala Torta and Cala Mesquida are naturally protected beaches with dunes, pines, and restaurants on the sand. For a more full-service (and, therefore, more crowded) experience, Cala Agulla and Font de sa Cala have changing rooms, sunbeds, and umbrellas for rent. To the south, the pine forests of Mondrago National Park give way to a tidy swath of sand, lunch spots, and dunes. Cala Llombards, just further south and west, is prime for snorkeling. After you come up for air, take the five-minute drive to Calo des Moro, a hard-to-find super-local bay beach surrounded by sheer cliffs. You may see signs saying it's private, but that's just to deter tourists. You have to walk half a mile from the road and take a steep set of stairs to reach the pristine spot. Just a light snack at Ca'n Joan D'Saigo. The island has culinary ambitions. Farmers are capitalizing on the incredible terroir (sea and salt and limestone and lots of sun), and restaurants are taking advantage of the local offerings. This, coupled with an injection of energy around New Spanish Cuisine, means an influx of Mallorcan locavore dining. The flowering terrace at is an excellent place to ingest a degustation menu of seafood and meat given the Michelin star. Locals can't get enough of chef , the restaurant and the chef of the same name who also recently opened Fosh Lab and Fosh Kitchen. The theme across the board is reinventing old favorites with fresh, seasonal ingredients. Even if you're not staying at the new Park Hyatt Mallorca you can take advantage of three square meals with three distinctly Mallorcan menus. 's gorgeous spread of local breakfast delicacies (tortillas, eggs, fresh fruits, sobresada, jamon) feels even more sophisticated served in a bright, soaring room of Danish Modern-inspired furnishings. The sunny has a pastry case and market for shopping local olive oils, potato chips, jams, and chocolates. And the cozy is decorated with aged hams and a gleaming meat slicer — bite-sized Catalan combos of cured meat-and-cheese can be paired with an excellent roster of Spanish wines and spirits. On warm nights, the outdoor fireplace is excellent for a night-cap; when it's cool the wood-burning oven will suffice. 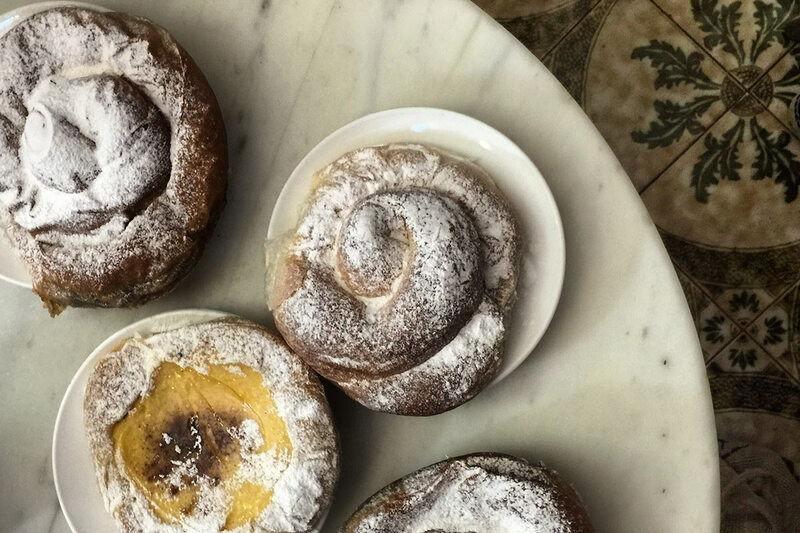 There's nothing subtle about ensaimadas, traditional pastries made with lard, dunked in thick hot chocolate, and eaten for breakfast. Oh, go ahead, you're on vacation! The place to get them is the 300-year-old , a delightful old-world cafeteria in Palma decorated with painted tiles, potted plants, and glass chandeliers. You'll find tourists there, sure, but also dapper grandmas reading the paper, young parents with their little kids, and a lovely staff who will brush powdered sugar off your collar before dropping off a very reasonable check at your table. 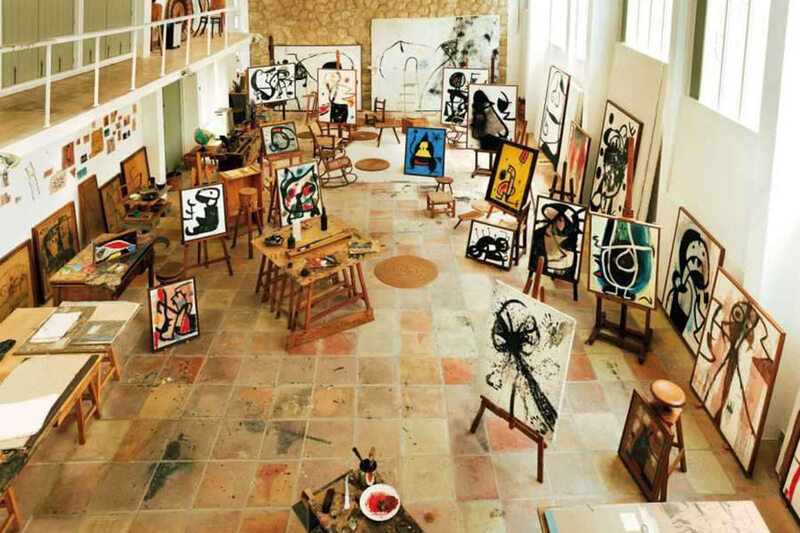 The studio of Joan Miró. Photo courtesy of Fundacio Pilar i Joan Miró. The Spanish island's capital city has a patchwork past of Bronze Age peoples, Ancient Romans (who encouraged olive and salt cultivation in 123 B.C. ), Byzantines, Muslims, and Moors. The jewel of the city, the impressive La Sau, or The Cathedral of Santa Maria of Palma, was built on the grounds of the Moorish-era mosque before it. The Catalans had Gaudí oversee the restoration, so as you can imagine, it gets pretty wild inside — particularly the chandelier over the altar. There's also an ambitious contemporary sculpture covering the walls of the nave. Wind through the side streets of the old city and duck into the alley leading to The Banys Àrab (Carrer de Serra 7), the last significant evidence of Muslim reign over the island. Ruins of the old caldarium (hot bath) and tepidarium (warm bath) are now set inside a beautiful little garden. You can visit the , the house and studio from which the artist lived and worked for nearly 30 years (his mother and wife were Mallorcan). A gallery displays sculptures, paintings, and studio pieces, including heavily realistic works from when Miró was eight years old. Mallorca is an island of limestone, and hundreds of thousands of years of deposits has resulted in an incredible system of underground caves. I know what you're thinking: If you've seen one stalactite, you've seen them all. I was preparing to be underwhelmed en route to the Caves d'Arta (Carretera de las Cuevas, S/N; +34-971-84-12-93), on the northeast coast of the island, but I was humbled! The grand entrance is a dramatic staircase rising 75-feet in the air and overlooking the sea. Visitors are led through a series of chambers of tapered mineral sculptures, hanging like icicles and dramatically lit to look like Dante's kind of inferno. The story goes that Jules Verne was inspired to write the sci-fi Journey to the Center of the Earth after his visit. 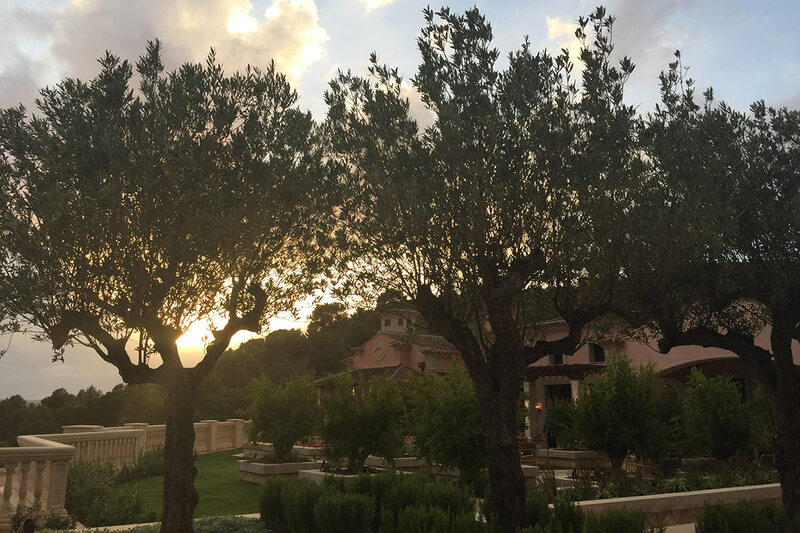 Sunset through the olive trees on the terrace at Park Hyatt Mallorca. is the schmancy answer on the island's east side (an hour from the Palma airport), up a hill from the beach. The owners are hedging their bets that this area will become the next It-destination. On the west side is , a decommissioned fortress with endless sea views. The recently renovated is set in a 17th-century finca in the foothills of Serra de Tramuntana. The meticulously curated , in the city of Palma, is Instagram-ready and quite affordable. The subtly swish is pitch-perfect with its beautifully lit lobby, generous drapes and upholstered walls, and Soho House-like rooftop pool in a small, sweet square next to the church of Sant Fransec. Get There: Iberian flights from Barcelona/Madrid to Mallorca clock in at 50 minutes and 80 minutes, respectively. There are also quick flights from London (parts of the island are very popular with Brits). Hire a Guide: For a spirited and academic tour of Palma's culture, history and architecture, call Maria José Bosch at or at (it's a mouthful! ).